The great people of Afrigadget (I am a contributor to this site and responsible for mentoring the newest South African youth to become contributors as well) are co-organizing the first event celebrating the innovators and inventors in Africa this August at Maker Faire Africa (http://www.makerfaireafrica.com) – it’s a 3 day event bringing together artists, inventors and all manner of ingenious people in Accra, Ghana. I was happy to make a lot of people happy! All donations for the Sony Ericsson were in, …I could make the Afrigadget grassroots reporters “Mobile”. Lukho and Zintle were very excited. They now both have a wonderful phone to work with. Zintle captures her stories with the Nokia N95, Lukho uses the Sony Ericsson C702. 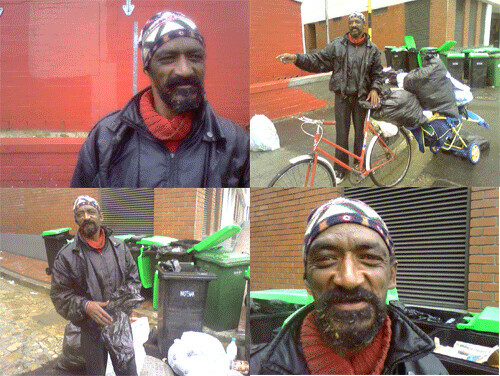 I had a very nice chat with a homeless Cape Town inhabitant, Madmoet Abrahams. He was so excited to hear that the photos I took would be online and viewed by a lot of people. The story of Madmoet is published on Afrigadget …go and have a look..
We have started the Afrigadget Grassroot Mobile reporting project!!!! How exciting!! With a big THANK YOU to David Sasaki who donated his Nokia N95. In Davids words: “I was given my N95 by the good people at Pop!Tech and I know they’ll be pleased that it will be used for such a worthy cause. And if you’re not reading Afrigadget you’re missing out.” I agree. And thanks Pop!Tech ! 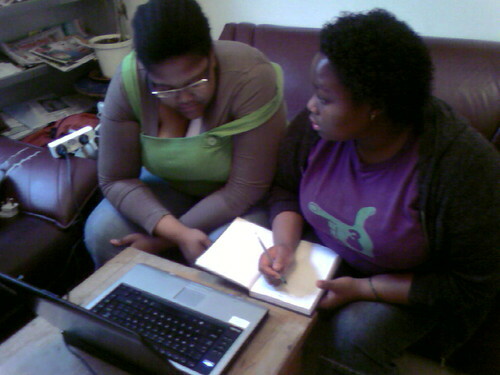 Yesterday evening we had our first session together: me in the kitchen, cooking….Lukho and Zintle behind my laptop, reading all the previous Afrigadget stories, exploring the phone, brainstorming together how to find stories. Wow! When I first read Fre’s email I thought excellent! This is exactly what Africa needs at the moment. The weekend before I received her email, my family and I were talking about how everything is going on a downward slope especially in South Africa with the politics and crime etc. I guess people find it very hard to look beyond all the bad things that are happening and actually focus on the good! Well I am very excited about this but I also feel kind of nervous because this is kind of intimidating a bit and I feel the pressure. The reason why I’m scared is that I don’t think there are enough (inventions, creative, unthought-of and untapped) things that are happening in Cape Town or in South Africa generally or is that I have been too isolated and ignorant to learn or go and find out about things that are happening in my community or the world that surrounds me? I plan to make the best of every opportunity that has been granted to be at Afrigadget. I got the new phone that was sponsored to us (thank you David Sasaki !!!!). It is the Nokia N95, which is perfect for Afrigadget. Like you said Fre, it might be a bit on the fancy side but it is sure worth it! Thank you very much Erik for doing this, it is a great opportunity for us! This is going to be a great avenue for us youngsters to realize the beauty of our countries and to show us that we can do more! My initial reaction to the Afrigadget project was one of tremendous interest, as I am keen on all things technological and consider this a great means to show the world exactly what Africa can do, and what our people are about and also the ways in which we think and live. It is now my chance to showcase a different slightly positive side to Africa, using mobile technology, irregardless of what people think they know about us from the BBC or CNN news media. So I ask you, what better way to do this than to start with resources that is universal to confirm Africa’s inventiveness? I am only too eager to start working on this project and am truly appreciative to people like Frerieke van Bree and Erik Hersman, who are innovative in such a way as to find a niche and then provide the correct platform for day to day ordinary people and present their inventions to the world.